South Kasai was a secessionist region in the area of eastern Congo (Zaire). Its flag was something like horizontally red-green or green-red with a large yellow 'V'. [smi75a]. The yellow letter V on the green-red flag of South Kasai was for Victory. The flag was used approximately from 1960-1962. The state of South Kasai was proclaimed in June 1960 by tribal chief Albert Kalonji. This flag is listed under number 6 at the chart Flags of Aspirant Peoples [eba94] as: «South Kasai (Independent state, 1960-62) - Zaire». The State of South Kasai lasted from 09 August 1960 to 02 October 1962. Ruled by President (later King), it was officially known as the Mining State because of its diamonds and other precious materials. Ivan Sache, 12 Sep 1999, quoting from [smi76]. I recently came across these 1961 photos taken in South Kasai which show actual examples of their flag: As you can see, the V is a bit smaller than what is illustrated above. On the other hand, the small flag on the Landrover in the second photo is more similar to the one we illustrate. So presumably, therefore, there were some variations in the flag design. 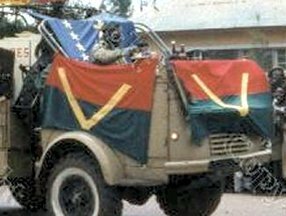 On this webpage and on this one is shown a flag quite different from the one we show for South Kasai, though it would fit the same verbal description, if put vaguely enough: "Its flag was something like horizontally red-green or green-red with a large yellow 'V'. [smi75s]".